Frozen ‘Nice Cream’ Drumstick Bites – these are AMAZING with only 4 ingredients! Place the frozen bananas & milk in a blender/food processor and blend until creamy & smooth. Spoon/pour into a silicone ice cubes tray mold (I used a pastry bag to make it less messy!) and place back in the freezer for 2 hours. Once frozen, melt chocolate in a microwave safe dish for 1-1:30 minutes, stirring every 20 or so seconds until melted. Remove ‘nice cream’ from the molds and place on wax paper. 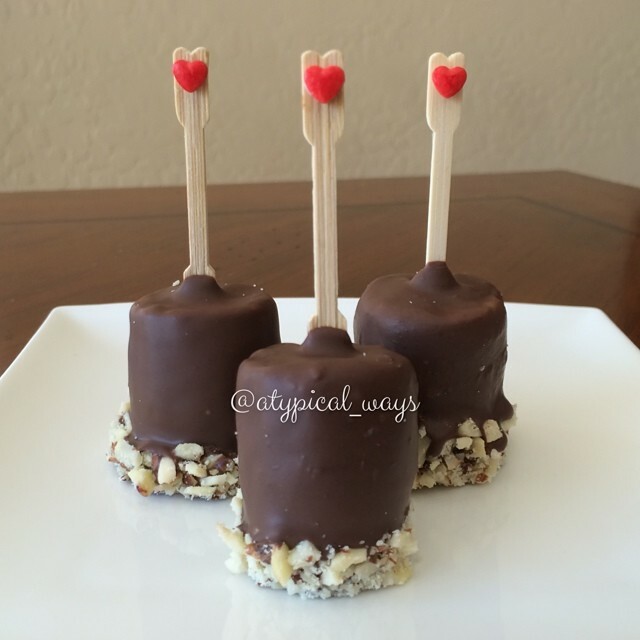 Insert a toothpick into the top, dip in chocolate with the help of a spoon and sprinkle with nuts. Work quickly to do the remaining bites and the place them all back in the freezer for 30 minutes to set! I’m not sure exactly how many this would have made because I ate a bunch of the ‘nice cream’ before I even poured it into the molds! Fun kids ‘Flower Box’ afternoon snack! Afternoon snack for my little guy! 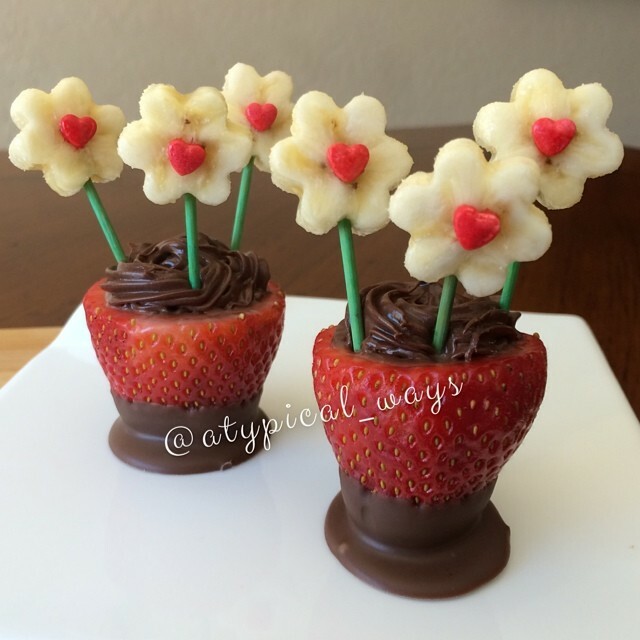 Strawberry & Banana flowers sitting in a rice crispy treat, Nutella & Oreo flower box! Cinnamon & Sugar Tortilla Bowls filled with Strawberry Greek Yogurt & fresh Fruit! Breakfast for my little guy! Preheat oven to 350 degrees. Cut two smaller circles out of the tortilla. Mix together the cinnamon and stevia on a small paper plate. Melt the Paleo Butter (@paleobutter) in the microwave for 25 seconds. Brush both sides of the tortillas with the butter and then dip them into the cinnamon sugar. Place in ramekins that have been sprayed with cooking spray and bake for 20 minutes or until crispy. Fill each cup with yogurt and top with fruit! First I mixed the pudding mix with 3 ounces of almond milk and placed it in the refrigerator to set. In my ninja blender I mixed the protein powder, stevia, 4 ounces of almond milk & egg whites. I preheated my skillet to low to medium low heat – I found that working with a low temperature was best as it allowed me to swirl & coat the pan with batter before it started cooking. In fact, I would hold the pan off the heat for 30 or so seconds before pouring batter in. Once I felt the pan was cool enough I would pour about 1/4 of cup into a small skillet and swirl around until the pan was coated with a thin layer. I would cook it until the edges started rolling in. I ended up flipping all of mine with my hands because I found it to be easier than trying to get a spatula under it. 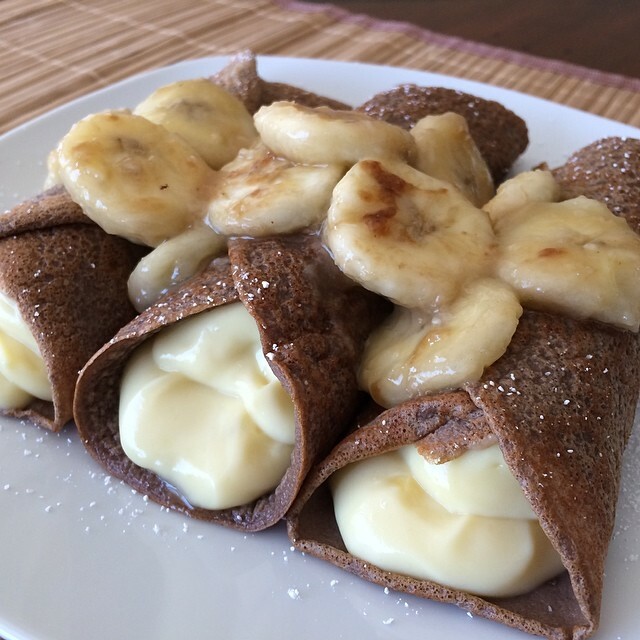 Once all of my crepes were made I took the pudding out, mixed the yogurt into it to really thicken it and then filled them. I quickly sliced up the banana and sautéed it for a minute or two with cooking spray and then poured on top!